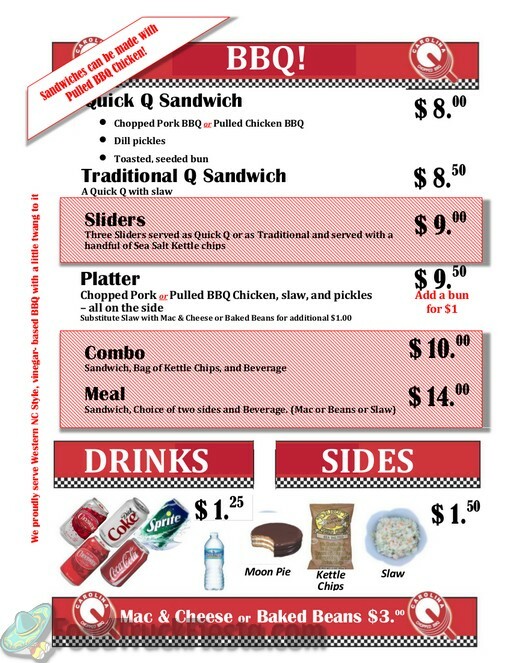 The Carolina Q truck was recommended by a friend. I had the Quick Q, it was so good it reminded me of the pulled pork sandwiches I get when I go back home to NC. Saw that this truck was going to be near my workplace and instantly got a hankering for some good ol' Carolina BBQ. I'm from NC and haven't had any good q since I moved here, but boy did this hit the spot. Moist pork, good sauce. NOTE: I asked for extra slaw - don't! I'm used to people skimping on slaw so I asked for extra, but it looks like their regular slaw portion is the perfect amount - extra slaw = too much. Added a Cheerwine and felt like I was back at home even though I was eating at my desk. Dry meat and fairly tasteless. I love BBQ, and would love to have something good come to Cap South. But this wasn't it. Tasty and absolutely huge portion of BBQ! I normally prefer Texas BBQ, but this one really surprised me. The meat was tender, tasty, and not fatty at all. I have never had Carolina BBQ before, and the sauce was different that anything I have had. Certainly adds an excellent punch to the flavor. The coleslaw was crispy and not over-mayo'd like most coleslaw. I love the fact this truck goes the extra mile and brings up the BBQ from North Carolina for that authentic taste. Kudos, can't wait to try the sliders with chips next time. It wasn't very good here in DC. Maybe this would have been better if it was smoked locally instead of delivered today from Carolina. I was disappointed on many fronts...first and foremost--where's the smokey flavor? Then the texture, maybe because it was chopped in Carolina, but, the texture was that of any meat way over chopped and chopped meat that sits for hours in the warmer just LOSES all the juices to the bottom of the pan...DUH! The pork was dry and had very little chew, it was more mush pile and not at all tender. The one positive was the BBQ sauce; not so much a BBQ sauce as a vinegar and pepper liquid. I admit being scared off by some of the prior reviews, but finally managed to try the truck and was pleasantly surprised - I think this is the best of the BBQ trucks, and the food is very consistent with what I've had in NC at Lexington, Stamey's, and Bill Spoon's (except for the unfortunate absence of hushpuppies!). It's true that it's light on the smoke but the meat still turns out very good, perfectly shredded, and the sauce is better than very good - vinegar-based without being pure vinegar (a somewhat larger container of it wouldn't hurt though). The sandwich that I had today from Carolina Q was mouth-wateringly good. The vinegar based BBQ spot was spot on and I will definitely make this sandwich a regular thing. No complaints! Fast service, great food and so much nostalgia for home. Cheerwine? Say no more!My only complaint is that it makes me homesick! No complaints! Fast service, great food and so much nostalgia for home. Cheerwine? Say no more! My only complaint is that it makes me homesick! Those Native to NC won't see this as the best Pork BBQ but it is a damn site better than any of the other slop I've tolerated from the other trucks and restaurants that say they server NC BBQ. Best I've had since I moved to the DC Metro in 2005. Hope they show at L'Enfant every Friday because I'll be there if they do. TOO MUCH SALT....not enough smoke,but can live w/ that if you would saturate the sandwiches w/ sauce. AND PUT SOME BIG BOTTLES OF VINEGAR SAUCE ON COUNTER SO WE CAN PUT IT ON OURSELVES, the little containers are ridiculous. 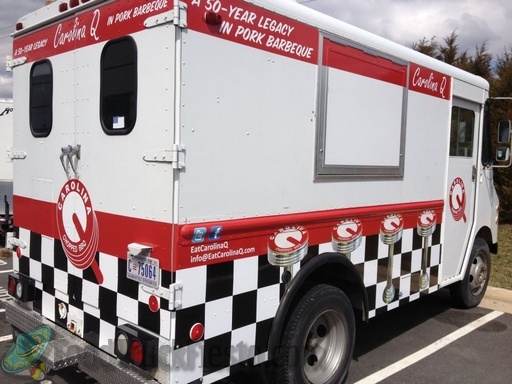 Carolina Q is a DC food truck serving Carolina Chopped BBQ sandwiches.